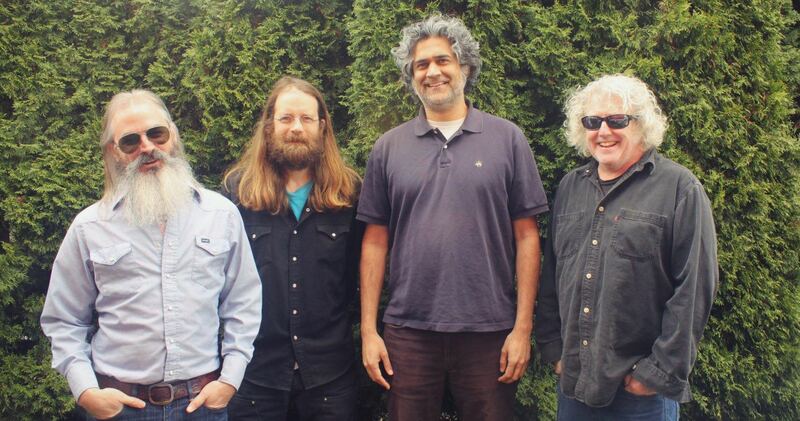 The dyed-in-the-wool psych-rock band returns with some of their most accessible songs to date, full of fuzz-pedal jams that capture moments of fleeting happiness in dark days. 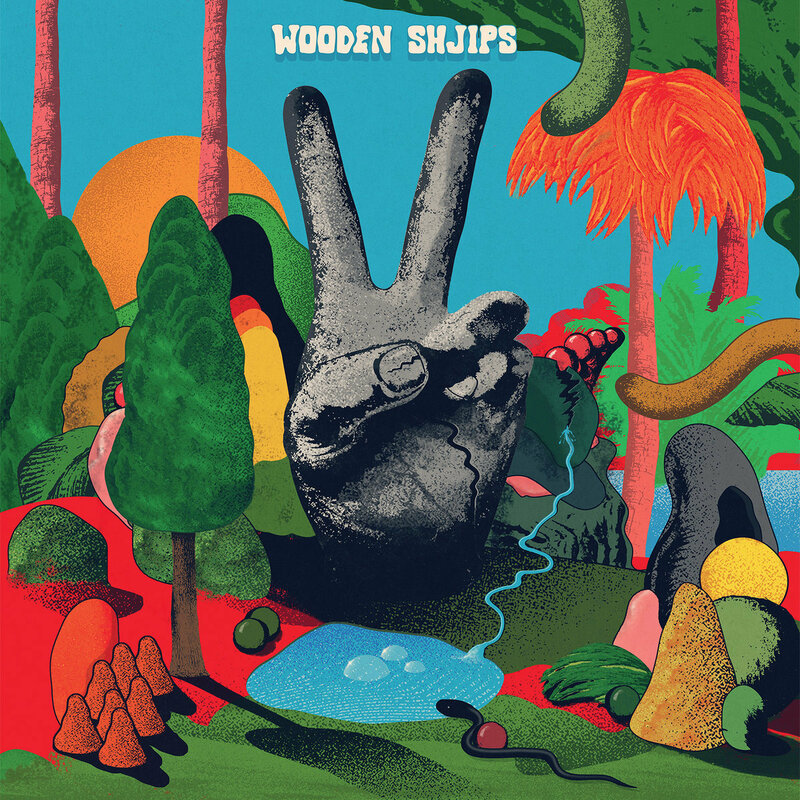 The cover of Wooden Shjips’ fifth album centers around a visual pun—a hand making a peace sign that doubles as the record’s Roman-numeral title, V. On paper, it sounds like a perfectly on-brand gesture from a band of West Coast psychedelic jammers who, even at their noisiest, always seems to be striving for tranquility through rhythmic hypnosis. But while the cover’s backdrop presents a splendorous tropical utopia straight out of an “H.R. Pufnstuf” episode, the peace sign itself is rendered as cold, cracked concrete. Perhaps it’s intended as a decaying monument to the death of ‘60s idealism, or a comment on how that era’s most incendiary protest music has fossilized into summer-barbecue soundtracks. Or perhaps it’s mourning the very notion of non-violent protest at a time when it’s become a fireable offense. Wooden Shjips have never been ones for overtly political statements; 90 percent of the time, you can barely tell what lead singer/guitarist Ripley Johnson is talking about in his smeared murmur. But if V. doesn’t exactly represent a shift toward newsticker topicality, its overall vibe—chill, yet resolute—suggests a desire to take that crumbling grey peace sign and rehabilitate it with some Poly-Fil and Day-Glo paint. Johnson has said that his goal for V. was to make a summer album—but in his case, he started writing it last year during a summer where the sun was being obscured by black clouds both figurative (the Trump administration) and literal (the fiery ash that was raining down on his home city of Portland due to the inferno consuming the nearby Columbia River Gorge). Instead, he came up with a record that’s all about savoring those fleeting moments of happiness when you can find them. Which is not to say V. is a record of passive escapism—the opening “Eclipse” marches in on a fuzz groove that suggests Suicide gone Motown, while a saxocalypse threatens to erupt from below. But Johnson’s liquid guitar fills serve as the emergency sprinkler system that keeps the blaze in check, gradually tilting the track from sinister to serene. In the past, listening to a Wooden Shjips record felt a lot like lane-merging onto an endless freeway where everyone’s going 100mph—your only option was to go with the flow and get lost in the blur. But if “Eclipse” assumes a familiar motorik motion, the rest of V. opens up a series of off-ramps. “Red Line” has all the hallmarks of a typical Wooden Shjips jam—rhythmic repetition, droning keyboards, backward-swirled guitar solos—but molds them into pop-song proportions and infuses them with an uncharacteristic bonhomie, yielding the most upbeat, immediately engaging tune in the band’s repertoire. And even when the band threatens to drift into a classic-rock cul-de-sac, they correct course with some inspired embellishments, like the woozy synths that permeate the Stonesy country rock of “Already Gone” or the keyboard clusters that brighten up the bluesy lurch of “In the Fall” like slow-motion shooting stars. But even as he’s singing his most accessible songs to date, Johnson’s voice remains a highly impressionistic instrument, his words wafting through like smoke rings, disappearing just as they seem to be acquiring definition. The grungy gospel ballad “Ride on” is Wooden Shjips’ bid for “Knocking on Heaven’s Door”-level gravitas, but in lieu of a proper, belt-it-out chorus, Johnson just lets the song’s church-organ tones and fuzz-pedal flourishes fulfill his mission to “head to higher ground.” Ironically, V.’s greatest moment of clarity comes from the song about gazing upon the city you love through a smoky haze. “Staring at the Sun” is at once V.’s most earthbound and interstellar track, and, fitting for a song that sounds just like Buffalo Springfield’s “For What It’s Worth” reinterpreted by Spacemen 3, it finds Ripley coolly mediating between outer turmoil and inner peace. “I was feeling low, staring at the sun,” he sings calmly from his Portland perch, before revisiting last summer’s scenes of “ashes falling ‘round the town.” But in Johnson’s hands, the apocalyptic destruction is rendered as a wondrous hallucination, with each mercurial guitar line glimmering like an ember floating in the sky. Because in this day and age, no summer album is complete without a laid-back, feel-good anthem for watching the world burn.